As a dog breeder, animal health is my top priority. That’s why I enthusiastically recommend NuVet immune system builder to all of my puppy families and training clients. Simply put, it is the best nutritional supplement available today. Hundreds of thousands of dogs and cats are using NuVet to protect against most ailments while maintaining a beautiful skin and coat. This is not just a vitamin. It’s an immune system builder with a precise balance of vitamins, minerals, omega fatty acids, amino acids and high-potency antioxidants. That’s why it works so well through all three stages of a dog’s life. For younger dogs(under 2 years old), it strengthens their immune system, while building and strengthening the cardiovascular, skeletal and nerve systems. For dogs in their prime(age 2-8), it improves the luster of their skin and coat while protecting against allergies, skin and coat problems, staining from tears, digestive problems, etc. For older dogs(over 8 years old), it helps protect against, tumors, premature aging, cataracts, heart conditions, diabetes and many types of cancer, while extending the life and improving the vitality of many dogs. The recommended maintenance dosage for a pet that weighs less than 5 lbs. is a half wafer/serving daily. Pets 5 to 100 lbs. need one wafer per day, and those over 100 lbs. need two wafers daily. If your pet is suffering from an illness you may increase the amount or give it to them twice a day. Remember, it is not possible to give them an overdose but for maximum effectiveness, doubling the recommended dosage is sufficient. I highly recommend NuVet Plus to keep your pet on the path to perfect health! It’s not available in stores, and is only available to the general public with an order code from an authorized pet professional. 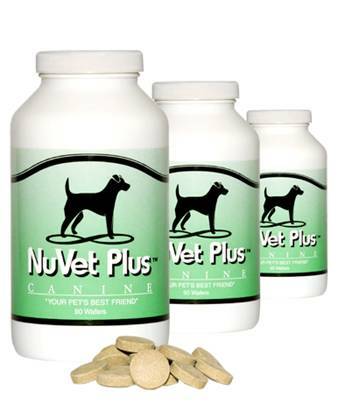 For your convenience, you may order directly from the manufacturer (at up to 50% off what most veterinarians charge) by calling 800-474-7044 and using Order Code: 47144 for your Discount, or ordering online at http://www.nuvet.com/47144 . You can also save an additional 15% and assure you never run out of NuVet by choosing the “AutoShip” option at check out. To the long life and health of your puppy!